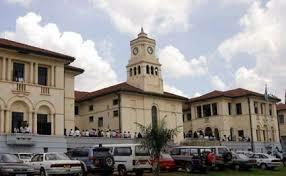 The High Court buildings in central Kampala remained largely empty as the sit-down entered its second working day today. PML Daily picture. A consolidated report compiled from all High Court Divisions and Circuits released last week by the Registrar, H.W. Isaac Muwata indicated that there is inadequate funding for court sessions. This unsurprising revelation was just another of several long-standing concerns holding work back in the judicial services which, like staff pay, remains unresolved. According to the report, the other challenges affecting optimum registry performance included rampant power failures, inadequate office space and storage issues. Shortly after the release of the report, judicial officers went on strike. Under their umbrella association, the Uganda Judicial Officers Association (UJOA), now in their second week of a sit down striker, judicial official officers are demanding for salary increment, transport allowances to enhance land justice, medical insurance, housing and security. The president of UJOA, also Iganga Chief Magistrates, Godfrey Kaweesi, said last week that despite judicial officers being ranked above other civil servants like Bank of Uganda Governor and Executive Directors of parastatal organisations, this isn’t reflected in their salaries. Chief Justice from Shs 20 million to Shs 55 million.